Get ready for the bright lights of the colosseum! We’ve taken our rock-solid RAT clone, squeezed it into a Eurorack module and added CV control over Gain. The 308 will take your playing to new heights with tremolo and other distortion modulation techniques. 4 Diode Settings – An on-board 4PST DIP Switch selects between 4 different clipping diodes to drastically alter your sound. Turn on the stock version 1N4148s, LEDs, Germanium diodes, or none at all with flick of a little switch. Vintage Tone – The PCB is designed from the original RAT tone IC, the LM308 single op amp. 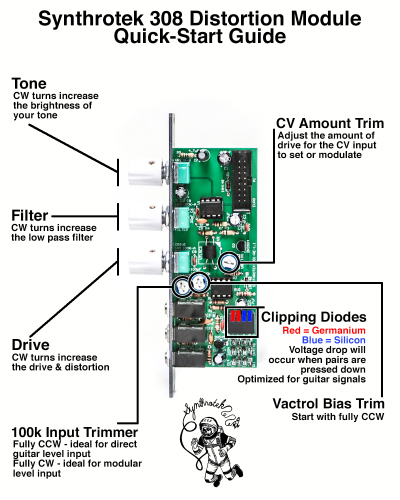 Guitar AND Modular – Adjust the input impedance with a trim pot. Plug your guitar in using Circuit Abbey’s Axis module. Current Draw: <10 mA on only the +12 rail. Available at our online store and at fine modular retailers worldwide. The product page says that you can switch to LED clipping but there are no LEDs in the BOM. Also 526-1N34A seems not to be carried anymore at Mouser (in fact many parts were unavailable or needed to be ordered in large bulk). Is there a nice sounding replacement for the 526-1N34A at mouser, or is it best to go to ebay? Is there an instructions for flipping dips? The critical LM308N seems not to be carried by Mouser any more. LED clipping is a completely optional mod, which is why they aren’t on the BOM. You would have to find ones that would work on your own and try them out to see if it works. For the 1N34A, they are getting harder to find, I would just use ebay to find some. Same thing also for the LM308, there should be some replacements floating around on ebay or other sites that you can get a hold of. For the vactrol, the ones from electronic goldmine will work just fine.